This health supplement has been scientifically developed to support health and provide dogs with a better quality of life! Bimini LLC was built on the founding principles of bringing advanced scientific knowledge and all natural ingredients to producing high quality supplements to support the health of our beloved pets. Our products are manufactured using eco-friendly practices right here in the USA. Our formulations are built by experts relying on extensive research and experience to produce highly palatable and effective supplements that your dogs and cats will enjoy and benefit from. We love what we do and hope that you will love our products. Bimini’s Best Dog Hip & Joint Health Supplement can be used to support and maintain normal healthy joints. It can be used with adult dogs over the age of one. This health supplement has been scientifically developed to support health and provide dogs with a better quality of life. The active ingredients: Cat’s claw, Willow bark, and high quality fish oil reduce discomfort associated with regular activity and the occasional inflammation and help lubricate the joints. - This is the AFTER Video taken after about a week on Bimini's. The Dog sitting down is the same dog as in the "before" video-- look at the difference! This health supplement is not a treat and should not be used to replace a high quality regular food, although it is designed to achieve a high level of palatability. If a dog does not accept it the chew can be reintroduced with enhancements or treats. Why Doesn't Bimini Use Glucosamine/ Chondrotin In Their Bimini's Best Hip and Joint Supplement? Bimini’s Best Hip & Joint Health Supplement for dogs is made with none of the usual suspects such as Glucosamine, Chondroitin and MSM. This is simply because the Bimini’s Best Supplement is designed to work in a different way. Glucosamine, Chondroitin and MSM are usually included in an attempt to rebuild degrading cartilage. However, in the majority of cases the cartilage cannot be rebuilt faster than it is degrading. That is why the conditions continue to worsen over time and very rarely are reversed. In some cases where some improvement is observed it is usually slow and may take several months to be felt by the dog and observed by the pet parent. Another reason why Bimini’s Best Supplement does not use those ingredients is because the market is saturated with them and there are enough other players using Glucosamine, Chondroitin and MSM in their products that adding yet another supplement that has the same active ingredients just doesn’t make any sense. How Does Bimini's Best Dog Hip and Joint Health Supplement Work? Bimini’s Best Canine Hip & Joint Health Supplement is a dose-form health supplement designed with the active ingredients Fish Oil, Cat’s Claw Root Extract and Willow Bark Extract. The Fish Oil and Cat’s Claw have each been shown in scientific research to help reduce the chances of the occasional inflammation becoming a worse condition. Willow Bark is the original pain killer and has been used for centuries by cultures across the world to reduce and manage pain. Willow Bark is the original source for the active that eventually was modified chemically to make the drug aspirin. However, in published studies Willow Bark itself, unlike aspirin provides pain relief without the side effects seen with the chemical aspirin. This gentle approach to managing the occasional inflammation and occasional pain makes Bimini’s Best Canine Hip & Joint Supplement an extremely useful alternative for veterinarians and pet parents alike. The basic premise is that it’s “the pain that is keeping the dog down”, if we manage the pain we help improve the quality of life which is the mission for Bimini LLC. Bimini’s Best Canine Hip & Joint Health Supplement is made and packaged in the United States. How Long Should My Dog Take Bimini's Best Dog Hip and Joint Supplement? All dogs should be seen regularly by a practicing veterinarian. For dogs that are showing signs of aging or the occasional pain Bimini’s Best Canine Hip & Joint Health Supplement should be administered daily and given as one chew for every thirty pounds of weight. However for younger dogs over the age of one and not pregnant or lactating that are not showing any signs then the supplement can be given on a maintenance basis which is following the same schedule as above but every other day. 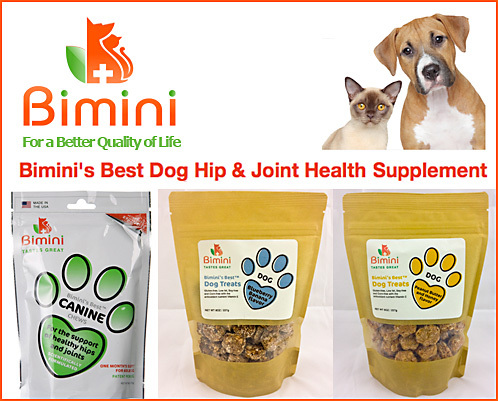 What Do Customers Say About Bimini's Best Dog Hip and Joint Health Supplement? My dog AJ is 12 years young and since he started taking Bimini's dog supplement I can see a noticeable difference in how he feels after going on hikes and exercise. At his age arthritis is an issue and he was slowing down a little but he is back to full speed! Thanks Bimini Pet Health! My 11-year-old dog has enjoyed Bimini's dog supplement, and they seem to help his arthritis, even in the cold, wet weather we've had the past month. Thanks! My Berner Buddha has had amazing results on Bimini's Joint & Hip Supplement. He was diagnosed with degenerative disc disease in his lumbar spine. The Vet said he may only have a month or two left before he would be unable to walk and be in a lot of pain. I began him on Bimini's product and his mobility improved, but most importantly his energy increased and he was a happy pup again. That was nine months ago. Thanks Bimini for giving my Big, Beautiful, Buddha Boy a Better Quality of Life! Order Bimini's Best Dog Hip and Joint Health Supplement Today! Joint health is vital to your dog's health, well being and quality of life. Bimini's Best Hip and Joint Health Supplement offers real help for your dog. You can find Bimini's at our BiminiPetHealth.com or Amazon.com and fine retailers. For more information and to place your order, please contact us today!